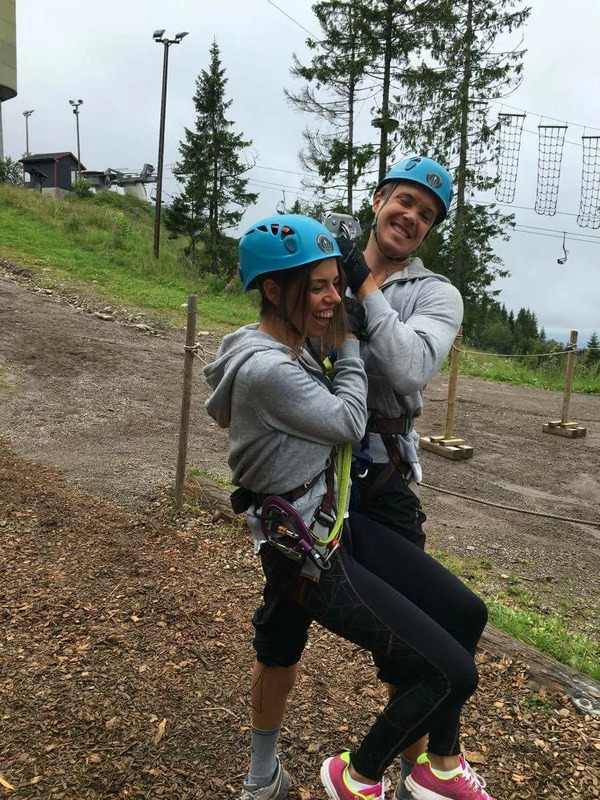 Today Robert and I went to a climbing park here in Oslo with two other couples. You get helmet, gloves, the right equipment and you can choose different climbing trails, including different kind of ziplines. I have to admit that it was my first time ever climbing and since I am afraid of heights it was not the easiest activity for me because sometimes I got seriously afraid but I managed to finish two paths and I am proud of myself ! ( Although the other guys were much better than me and did more advanced trails). Unfortunately, in the afternoon it started to rain pretty heavily so we had to leave sooner than expected but we enjoyed a few hours at the park! They offer trails for children too and I think it is a great weekend activity for families, you can be in the forest, enjoy some sport and maybe grill! Here are a few pictures from today, before we started climbing ( I did not have my phone with me so we could not take so many pictures)!